"This is a recipe my boyfriend's mom gave to me. I like to add the ginger because it gives it a nice zest. It's great for potlucks and you can adjust the seasoning to your taste. The cashews and toasted noodles add a terrific crunch!" Toast the dry ramen noodles in a skillet over medium heat until golden brown, stirring frequently, about 10 minutes. Spread the noodles into a large mixing bowl to cool; set aside. Make the dressing by whisking the vinegar, soy sauce, garlic, ginger, red pepper flakes, and black pepper together in a small bowl. Whisk in the peanut oil and sesame oil until blended and thick. Combine the peas, jiciama, water chestnuts, celery, green onions, and cashews in the bowl containing the toasted noodles. Pour the dressing overtop, and toss to mix immediately prior to serving. A crisp, colorful salad that brings a little heat with Thai and jalapeno chiles. This was just strange for me. I can't say it was bad (probably because I eat almost anything) but it wasn't good. I made it for company and all agreed "this is weird". 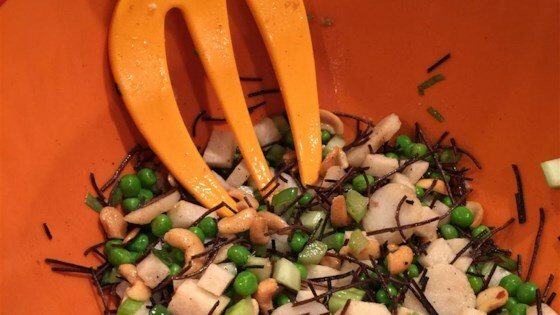 Delicious blend of sweet (peas) and salty (cashews + soy sauce)! I had just run out of oil and onions, so put in neither one, but the taste carried through! Great crunchy salad! Fresh and light (words I don't often use to describe asian food!). The Chili Flakes are the X Factor! Delicious! So great, but only with the flavor packet from the Ramen. I used pork flavor. Love this salad! I substituted black bean pasta for angel hair. Good enough for a dinner party.